Like its eponymous subject, Sully is pretty low-key and soft-spoken. That’s not entirely complimentary, given the life-altering drama that thrust Capt. Chesley “Sully” Sullenberger into the headlines. It’s the stuff of legend. The flight itself was a mere 208 seconds, the plane suffering crippling engine damage caused by unprecedented bird strikes. During the 24-minute rescue, 1,200 first responders tended to the emergency. Granted, for most memories, the story ended full stop with Sully’s heroic, stoic handling of the situation. But there were follow-up pieces questioning Sully’s decisions and his state of mind at the time. Sully is billed as the "untold" story of the incident and its aftermath, but that’s a silly tag line, given the screenplay is based on Sully’s autobiographical account, Highest Duty: My Search for What Really Matters, published in 2010. Without question, it was a harrowing experience. And, from a cinematic point of view, it seemed as though director Clint Eastwood was going to raise the bar for presentation by filming the entire movie with IMAX cameras. The opportunity to create a uniquely immersive experience held so much promise in the extra-large format, given the groundwork set by the likes of Christopher Nolan, James Cameron and Peter Jackson. Surely Eastwood had a certain end effect in mind, an intent to create a visceral sensation without the gimmick of 3D. Watching Sully in IMAX is indeed a cool treat, but it misses the potential experiential thrill of the water landing presented in full-frame, giant-size imagery supported by state of the art surround sound. It’s disappointing to report Sully is simply a movie with a great American story competently told, but it’s one that remains stubbornly grounded. The most striking visuals are derived from what didn’t happen: Sully’s plane careens into a Manhattan skyscraper. 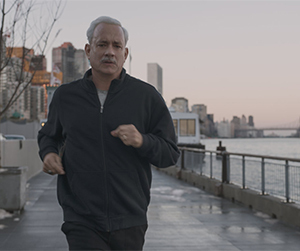 Following the incident, Sully (a fine portrayal by Tom Hanks) is overwhelmed by media attention and faces an inquiry by the National Transportation Safety Board. And therein is the crux of the movie’s problem. Ultimately, Sully turns into a courtroom procedural. The story shifts into chatter of computers and algorithms, quietly portraying the NTSB as a heavy-handed organization merely looking out for the best interests of insurance companies. Simulations indicated the plane could’ve safely returned to LaGuardia. Those simulations, though, rooted out the human element — further distorted by numerous practice runs — and the need to assess in real time the impact of an unprecedented incident. In some respects, that sums up Sully. It’s had the human element subdued in favor of overly-calculated storytelling.